Investors were on a Fed-induced high this week, pushing stocks to their best levels in several years. 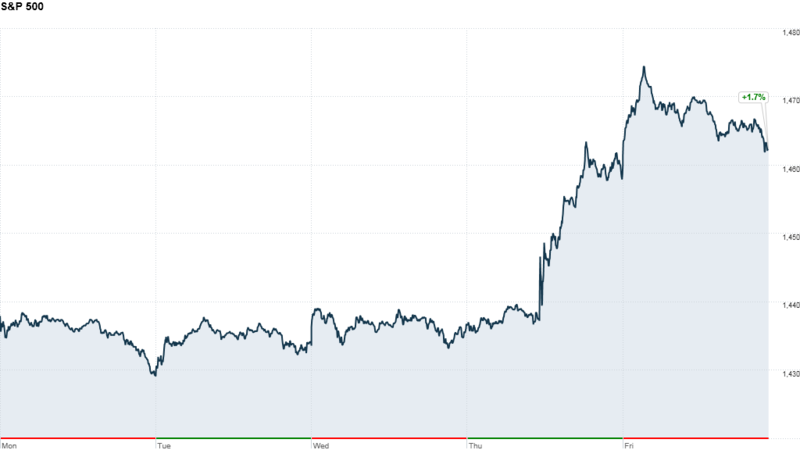 Stocks rallied Friday, albeit more modestly than the surge immediately after the Federal Reserve announced a third round of quantitative easing, or QE3, on Thursday afternoon. The Dow Jones industrial average, S&P 500, and Nasdaq all posted gains between 1.5% and 2.3% for the week. The Dow and S&P 500 are at their highest point since the end of 2007 while the Nasdaq hasn't been at this level since late 2000. All three indexes moved up between 0.4% and 0.9% Friday. The Fed said Thursday it would buy $40 billion of mortgage-backed bonds each month for however long it deemed necessary. With no end-date in sight for monetary loosening, investors viewed the Fed's moves as the best possible stimulus for the markets. "The Fed gave us even more than we expected and so much money has been sitting on the sidelines that people are starting to chase performance," said Douglas DePietro, managing director for sales trading at Evercore Partners. "There's some really good support to this rally." After the Fed announcement, trading volume, which has lackluster overall this year, picked up dramatically, according to several traders. Shares of homebuilders, including PulteGroup (PHM), Toll Brothers (TOL), and Hovnanian Enterprises (HOV), continued to soar on news of the Fed's mortgage buying program. Big banks Citigroup (C), JPMorgan Chase (JPM), Bank of America (BAC) and Goldman Sachs (GS) were also among the top gainers. The optimism carried over to the commodities market Friday, pushing oil prices up 0.7% to $99 a barrel. Gold, which is used as a hedge against inflation, also continued to climb, with prices touching a seven-month high before easing to $1,772.70 an ounce. Meanwhile, U.S. Treasuries sold off sharply, pushing the 10-year yield to 1.87% from 1.74% late Thursday. In yet another sign of investor exuberance, or perhaps even complacency, CNNMoney's Fear & Greed Index hit an all-time high of 94, showing that investors are in 'Extreme Greed' mode. Related: Are investors getting too greedy? World markets, which had already closed ahead of the Fed announcement Thursday, joined the rally Friday. European stocks jumped between 1.5% and 2%. Asian markets ended higher, with the Hang Seng in Hong Kong surging 2.9% and Japan's Nikkei gaining 1.8%. Economy: Retail sales came in higher than expected, rising 0.9% in August, the Census Bureau said. August inflation was in line with what analysts had anticipated, with CPI increasing by 0.6%, according to the Bureau of Labor Statistics. The Federal Reserve's data on industrial production for August showed a steeper-than-expected drop of 1.2%, while the preliminary edition of the University of Michigan's Consumer Sentiment Index for September came in higher than expected. Data on July business inventories from the Census Bureau also exceeded forecasts. Companies: Apple (AAPL) shares hit another all-time high, two days after the company unveiled the latest edition of its wildly popular iPhone. Amazon (AMZN) shares also rose to an all-time high. UnitedHealth Group (UNH) rose on the news that it will join the Dow Jones industrial average, replacing Kraft Foods (KFT), starting Sept. 24. 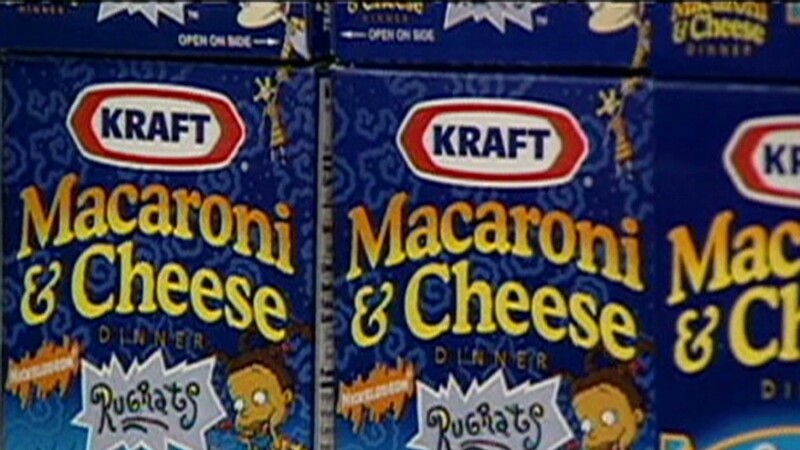 The index change came as Kraft plans to spin off its North American grocery business, which will be renamed the Mondelez Group on Oct. 1. The Dow Jones Averages Index Committee said in a statement that it believes Kraft's plan will "reduce market capitalization" and revenue, making the company "less representative of the U.S. large cap market space." Shares of Staples Inc (SPLS) were up 2% on a report by CNNMoney sister publication Fortune that several private equity firms, including Bain Capital, are considering a buyout offer for the office supplies retailer.